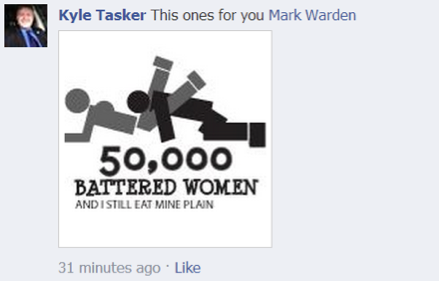 WASHINGTON -- New Hampshire state Rep. Kyle Tasker (R) went on a public Facebook forum Monday and posted a sexually explicit joke about women who have been the victims of domestic abuse. The discussion on the Facebook page of the Greater Nashua Tea Party arose over the New Hampshire GOP's refusal to stand by another state lawmaker, Rep. Mark Warden (R), who has come under scrutiny in recent days for saying, "Some people could make the argument that a lot of people like being in abusive relationships." Tasker and others on the Facebook page defended Warden, with Tasker commenting, "Warden is so principled it offends people." The lawmaker's comment was first reported by New Hampshire blogger William Tucker on his site, Miscellany: Blue. As of Tuesday afternoon, the post with the "battered women" joke was no longer up, but Tucker sent The Huffington Post an earlier screenshot of the thread. View the screenshot here. Another commenter on the thread told Tasker that his post was "over the line," to which Tasker replied, "People are making money off that but Mark's getting the press for a trivial comment ... Now if we went around wearing the T-shirt that wouldn't go over well." That post has also been removed. Tasker did not return a request for comment. 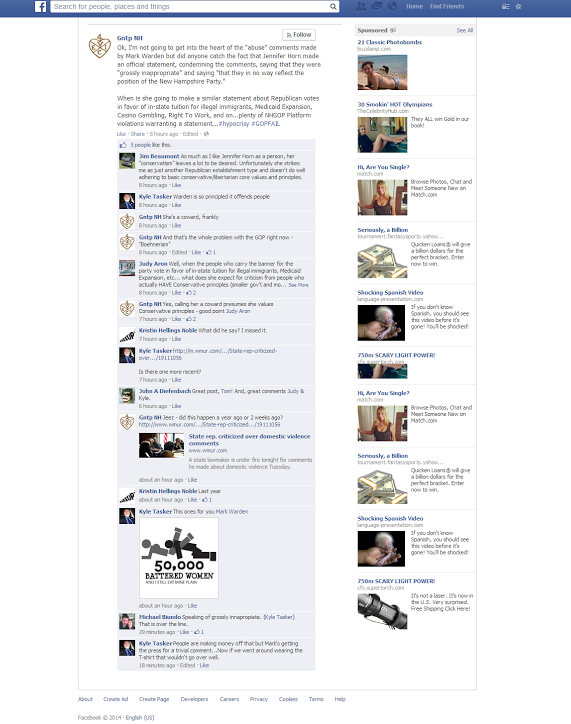 The lawmaker has been quite open with his opinions on Facebook in the past. In early February, Tasker expressed regret for backing a bill to expand the use of mental health courts, lamenting that his "name is attached to this turd." He also once accidentally dropped his gun on the floor during a committee meeting.